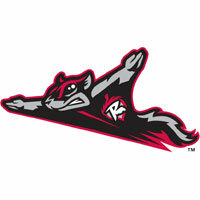 In arguably the most dramatic ballgame in franchise history, the Flying Squirrels (10-11) lost a ninth inning lead, went behind by a pair of runs in the 13th, and still won. Richmond scored three times in the bottom of the 13th inning to steal back a, 5-4 victory over the New Britain Rock Cats on Friday night. Trailing 4-2 to the bottom of the 13th, the Squirrels turned the other cheek and delivered the knock-out blow. Left-hander Blake Martin started the inning on the hill and issued a one-out walk to Wendell Fairley. Chris Dominguez followed with a double off the very top of the wall in center field. Fairley scored, and Richmond had the tying run at second base. New Britain went back to the bullpen for right-hander Bobby Lanigan. Juan Perez got ahead in the count and sent those left at The Diamond into hysterics with a two-run walk-off blast to left field. Perez’s second home run of the season was the game-winner, dooming Lanigan (1-2) to the loss. After plating two runs to force extra-innings in the ninth inning, New Britain had posted two runs in the 13th against Richmond right-hander Daryl Maday. Evan Bigley started the inning with a single and was forced at second base. With one out, Aaron Hicks lined a two-run home run over the wall in right field. Hicks’ fourth home run of the season put New Britain ahead for the first time on the night. Both starters began the game with two scoreless innings, but the Squirrels got on the board first against left-hander Andrew Albers in the bottom of the third. With two outs, Ryan Cavan drilled a double into the left-field corner. Gary Brown followed and lashed a single into right-center field. Cavan came in for a 1-0 lead. Richmond padded their lead with another run against Albers in the bottom of the sixth inning. Cavan beat out an infield-single to start the threat. Two batters and outs later, Tommy Joseph punished a double to dead-center field, one-hopping the wall. Cavan sprinted around from first base for a 2-0 cushion. Right-hander Justin Fitzgerald was superb for seven innings, subduing the Rock Cats on five hits. He walked none and struck out five, but did not factor in the decision. Albers was on the hook for the loss upon his departure after the sixth. He was charged with two runs on eight hits, walked one and struck out six. Left-hander Chris Gloor worked a scoreless eighth inning and came back to start the ninth with a 2-0 lead. Chris Hermmann started the Rock Cats revival with a double off the wall in right field. Gloor was lifted in favor of right-hander Jake Dunning. He quickly recorded the first two outs, but conceded a single to Hicks that plated Herrmann. Dunning worked ahead of Deibinson Romero 0-2, but Romero was able to guide a double into the alley in right-center field. Hicks scampered all the way around from first base to tie the game, 2-2. Dunning completed the inning, but was unsuccessful in his first save opportunity of the season. Maday (2-1) was pulled off the hook for the loss and earned the win for the Squirrels. Richmond used six pitchers in the win, while the Rock Cats also used six hurlers in the loss. The Squirrels continue their three-game series with the New Britain Rock Cats (Minnesota Twins) on Saturday night at 6:35 PM. Richmond RHP Craig Westcott (0-2, 6.43) will oppose New Britain RHP Steve Hirschfeld (2-1, 2.78). Tickets are available and can be purchased at SquirrelsBaseball.com.